For more than sixty years, there’s been no such rain. 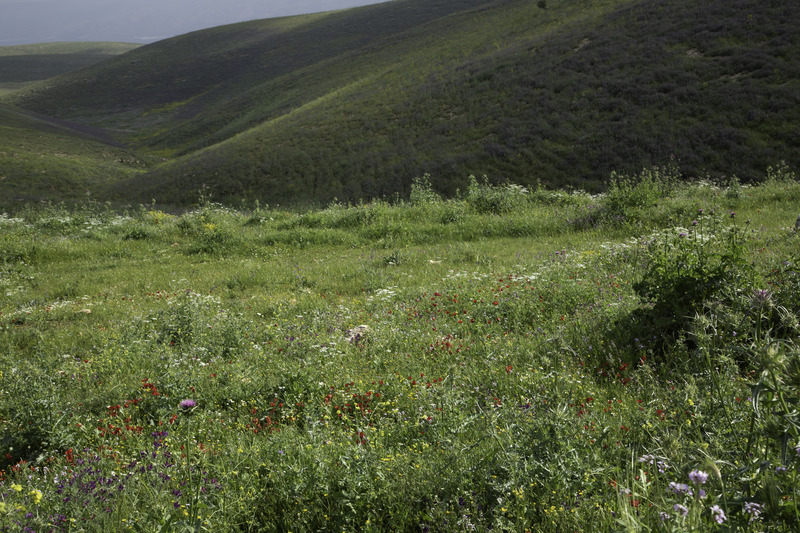 The hills are soggy, muddy, greener than green, thick with blue and purple echium and crimson anemones and poppies. There’s a strong spring wind; steep white clouds race overhead. The sheep and goats are feeding steadily. Burhan, whom you may remember from earlier dispatches, crouches close to the ground, rolling his cigarettes. So far it’s been a peaceful morning. He says it’s quiet because we’re here. His brother said the same thing a few minutes before, farther down the slope. The sheep bells are clanking gently, the echo muffled by the wind. From the army base in the wadi comes the popping and clicking of soldiers at target practice; sometimes it swells to a steady, rasping roll, trr-trr-klk, when they move the little metal clasp on the rifle from “single” to “multiple”, and then you can’t hear the bells any more. 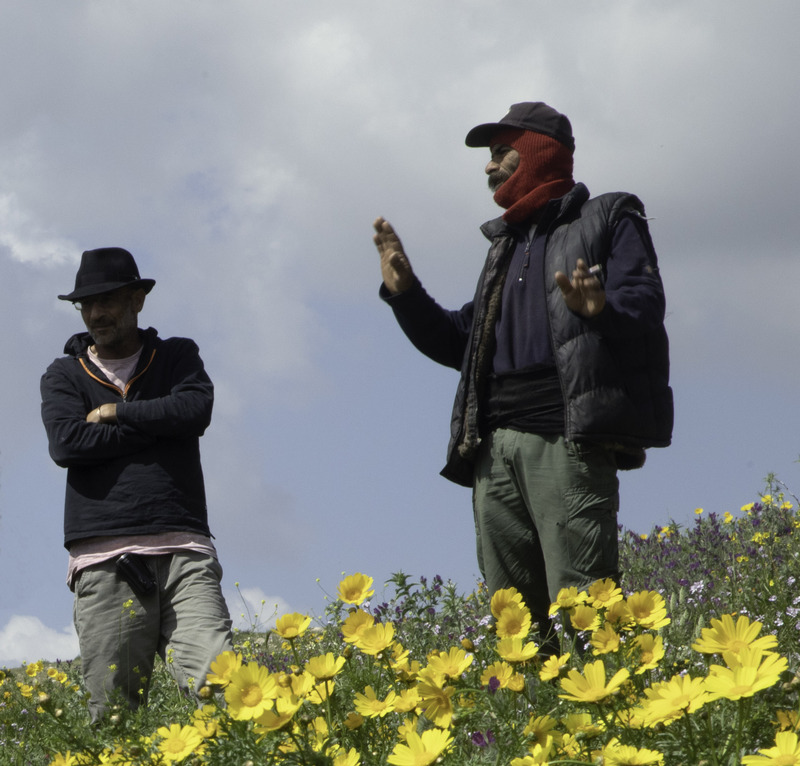 I say to Yusuf, both of us staring downhill through the grasses and flowers toward the distant blue hills, “If there were no soldiers here and no settlers, we’d be in Paradise.” It sounds a bit weird in Arabic. He turns the sentence over in his mind before he agrees. He was born into the world of the Occupation, he has never known any other world. 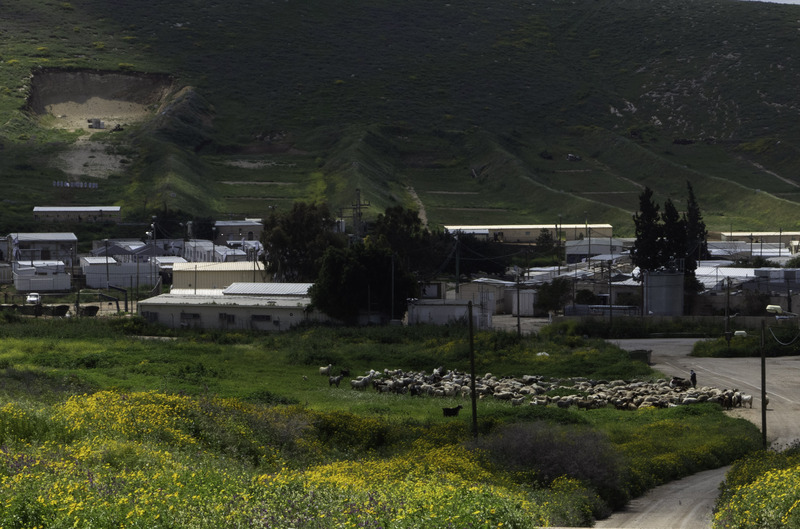 Earlier we waited near the settlement of Hemdat for Tahsin and Hamudi to arrive from Al-Hadidiya. Recently, Hemdat has become more aggressive; on Friday, two of our women activists were arrested here. The commanding officer in this theater is mad at us (especially at Guy, who was arrested at his command two weeks back, spent the night in jail, then was released by the judge the next morning, to the army’s chagrin). 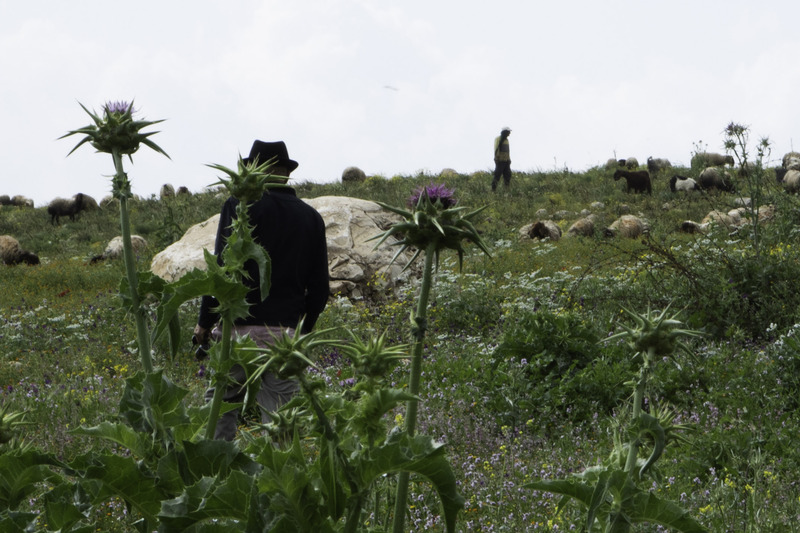 The officer doesn’t like human-rights activists spoiling his fun, for example, when he’s busy driving Palestinian shepherds off their land. But today he’s not to be seen. 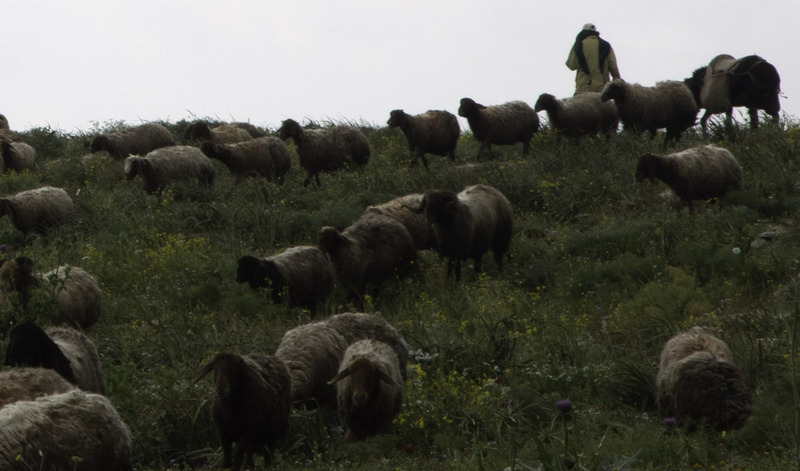 Eventually, Hamudi arrives with the hungry sheep; they are heading east, down into the Valley, thus away from Hemdat. We embrace him and, since he won’t need us now, take our leave. I’m glad to be back. It’s been almost three months. First, in December, a car drove over my foot; for a while I couldn’t walk. Then there was a month in India with our students and in Sri Lanka with colleagues and activists, the latter fashioned entirely in the Ta’ayush mode. Here we are just three weeks away from another election. 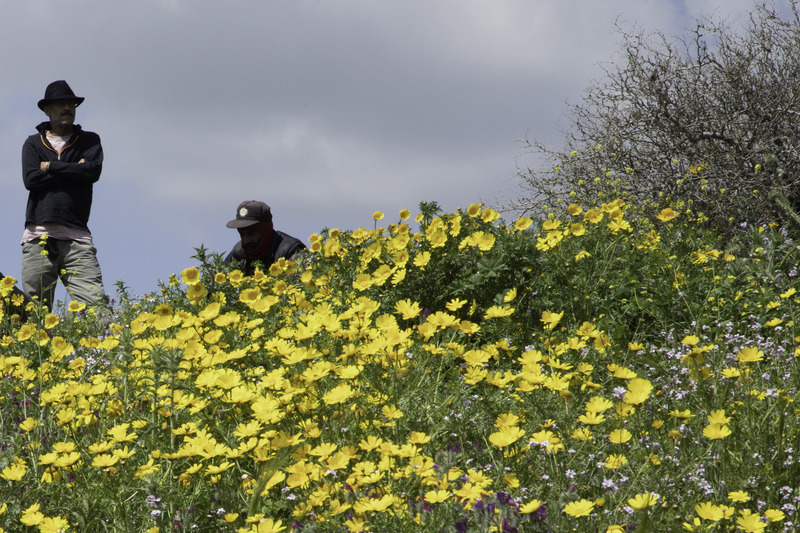 Pre-election weeks always generate more violence on the part of settlers; maybe they get nervous, or maybe they think, not without reason, that hurting Palestinians is one way to win votes in Israel. 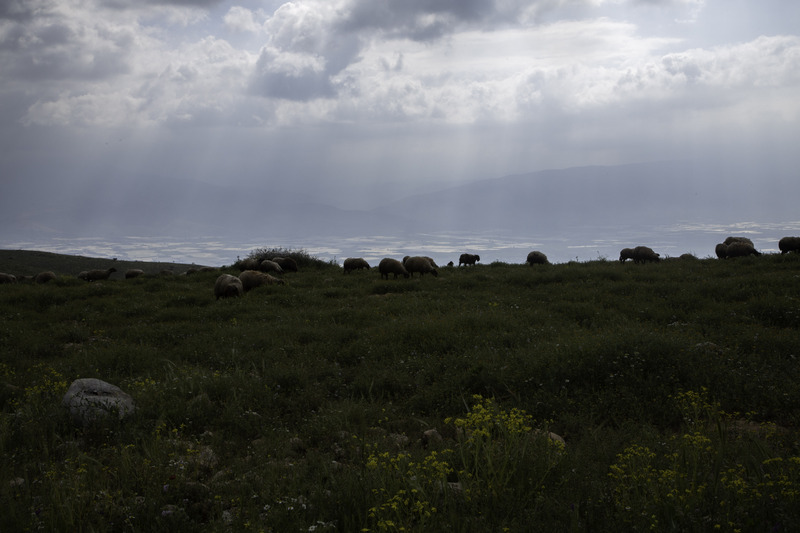 Three herds, three gentle conversations with the shepherds, dozens of satisfied sheep and goats, no army jeeps, no demented settlers, the smells of spring: Paradise. It’s a good day’s work. All the wounds, old and recent, are still open. 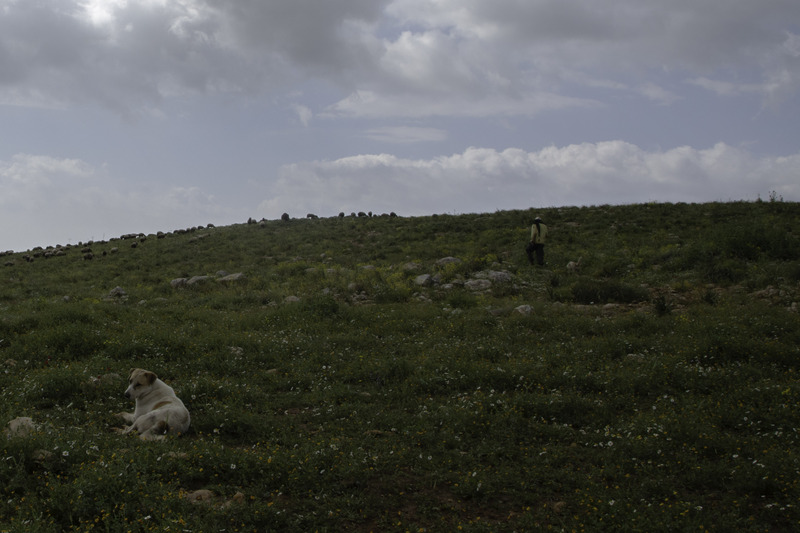 A few days back, the army confiscated two Palestinian donkeys. 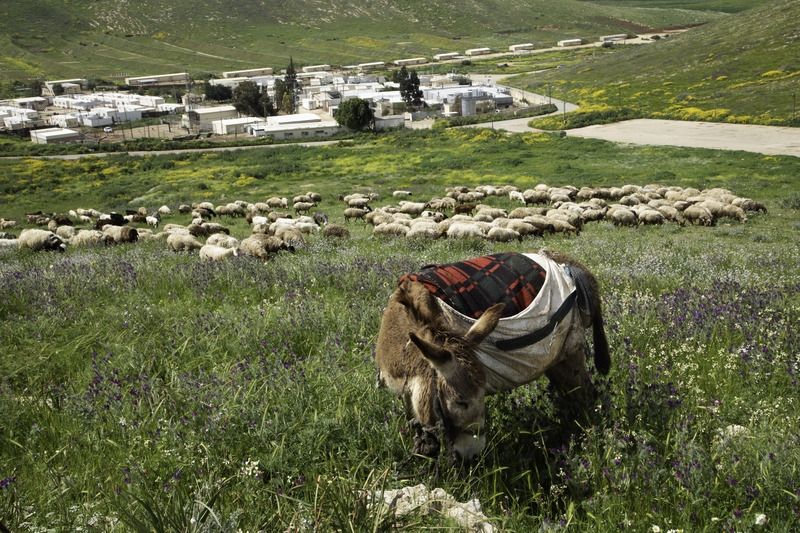 That’s a big thing: for a Palestinian shepherd or farmer, losing a donkey is like losing one’s legs. There’s not that much we can do about those two. 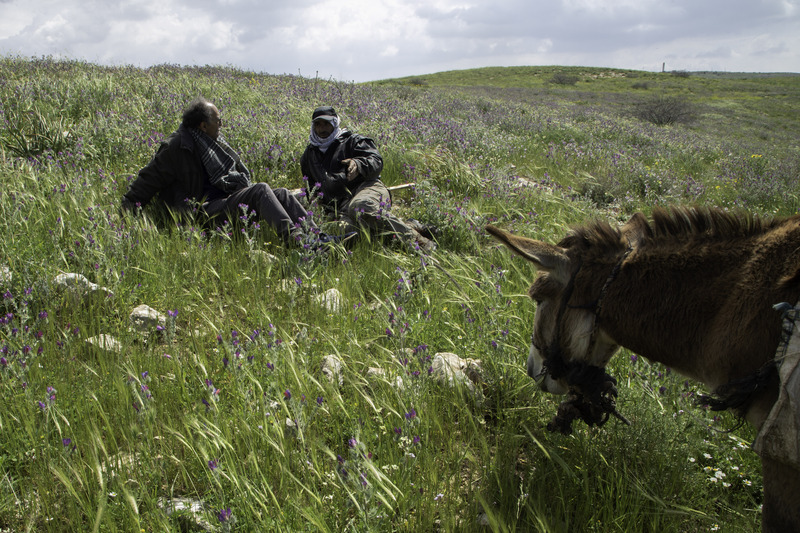 Then there are two more donkeys that settlers from the illegal outposts stole last week. They are presumably being kept somewhere in the outposts. Is there some way to retrieve them? We’ve already complained to the police, who have, needless to say, done nothing. Why should they act? These are not Jewish donkeys. Guy says that to prod the police into action, he would have to go personally to the police station, and not alone—he could either take with him someone like me, someone who has won a prize or two, or, alternatively, he could take three rough-and-ready Israeli street-toughs. I like this equation: I’ve been significantly upgraded. But the tranquility is too good to be true. 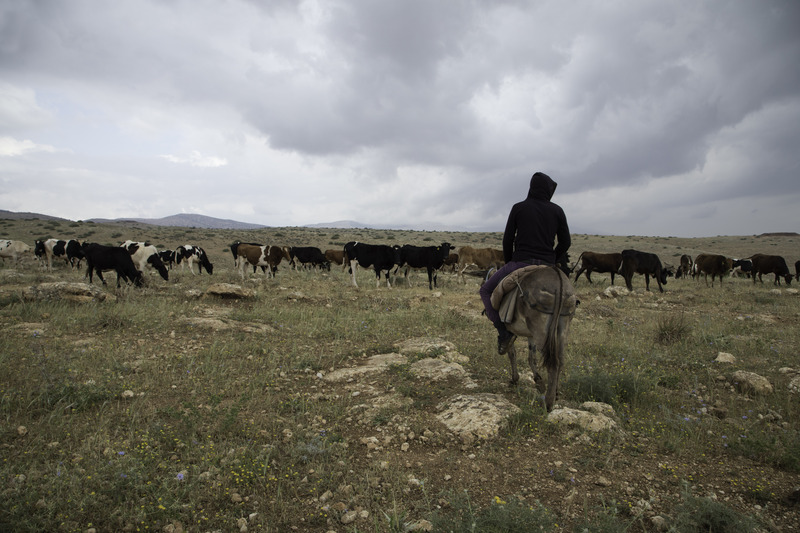 We are already on the way back to Jerusalem when the four Tel-Aviv activists call to say that settlers at Umm Zuqa are driving away Palestinian herds. The activists have called the army, which has ignored the call. So far, the settlers control the field. Guy calls the army hotline. Here’s a piece of the conversation between him and the duty officer. [Guy]: I am calling to report terrorist activity. [Duty Officer, sounding interested]: Terrorists? Where are they? [Guy]: They’re Jewish terrorists from the illegal outpost at Umm Zuqa, and they are driving Palestinian herds off their grazing grounds. [Duty Officer, confused]: Jewish terrorists? What do you mean? [Guy]: Yes, terrorists, you know them well. They’re the ones who are constantly harassing Palestinians around here. Why haven’t you sent anyone to stop them now? We called twenty minutes ago, and they are less than 500 meters away from your headquarters. [Duty Officer]: Just a minute, I’ll check. A moment or two of silence. Then the line is cut. Guy calls again. [Guy]: So have you sent a jeep over there to stop the terrorists? [Guy]: The ones I just told you about, in Umm Zuqa. [Duty Officer]: Look, we’re in headquarters, we’re a long ways away from Umm Zuqa. [Guy]: I know, but you have an army base right next to it, it can’t take you more than two minutes, maximum, to get soldiers to the shepherds. [Duty Officer]: We’re looking into it. [Guy]: Stop looking into it, just send the jeep now. [Duty Officer]: I don’t understand you. [Guy]: I think you understand me very well. Why are you wasting time? You don’t care about those shepherds? 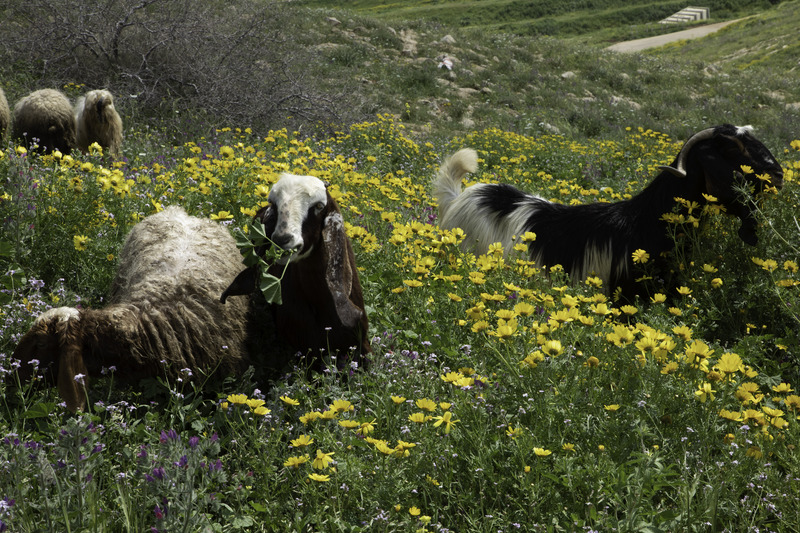 And while we’re speaking, what about the two donkeys that the settler terrorists stole last week? I informed you 4 days back. [Guy]: The ones the settlers stole. You know what I mean. What have you done to those donkeys? Did you shoot them in order to destroy the evidence? [Duty Officer, after a pause]. I haven’t shot any donkeys. [Guy]: Have you done anything to get them back? [Duty Officer, nonplussed]: Look, I work in the Civil Administration. My job is to see to the welfare of the local population, to help arrange work permits and travel permits and things like that. [Guy]: I know that’s the job description, but then I wonder why for the last many years you’ve done nothing but torture these people, knock down their houses and tents, deny them water, threaten them, and make their lives miserable in every way you can think of. Was that silence the subtle sound of shame? I doubt it. 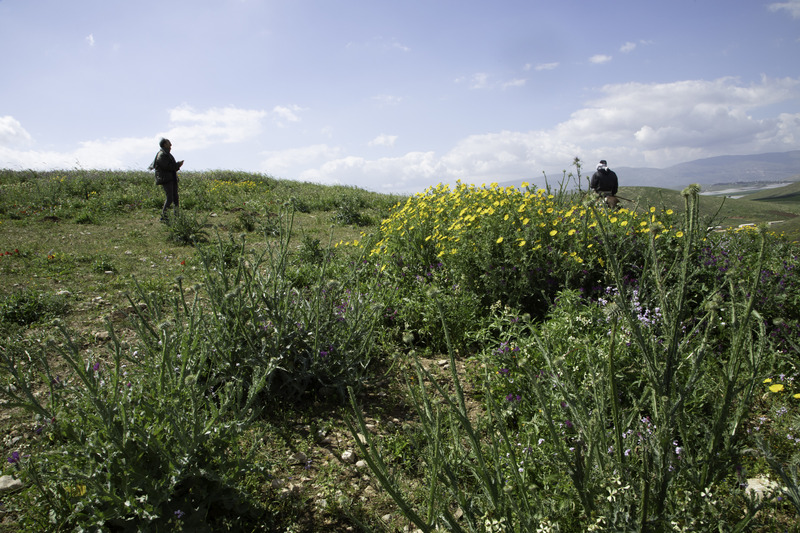 Still, a few minutes later we hear that soldiers arrived at Umm Zuqa and took the marauding settlers’ identity cards. It’s just barely conceivable that the police will press charges. It won’t happen, but still—another whiff of Paradise. I LOVE the photographs. 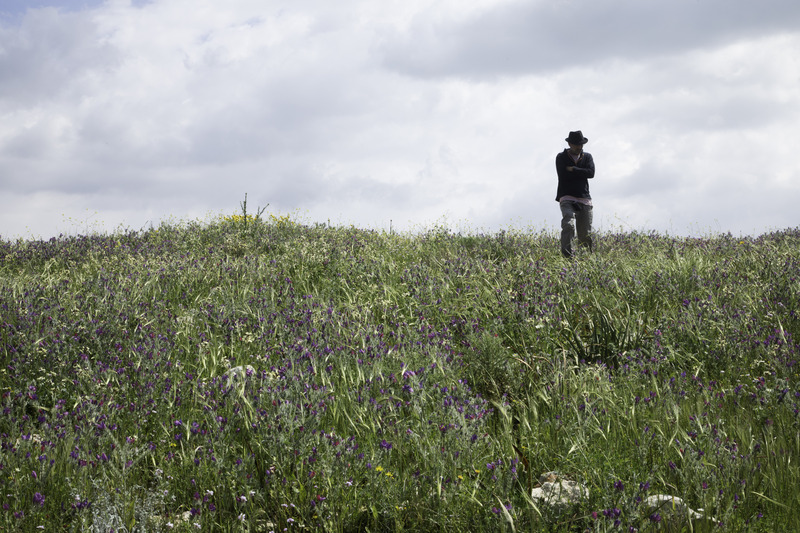 In all my 23 years in Israel I have never been there at this time of year and have always regretted that I have not seen the fields alive with flowers. What a spectacular sight. As I was reading your description of the day I was in suspense as to when this idyllic day would come crashing to an end. 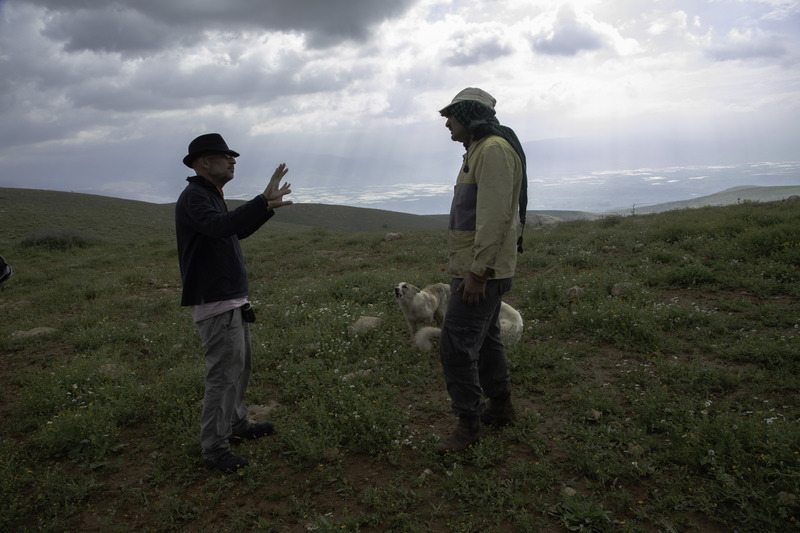 I kept waiting for the ” and then” ……..”and then” and then it finally happened with the settlers putting an end to such a wonderful day for shepherds, sheep and activists. The conversation with Guy was priceless to have in print . No one sound believe that this is standard procedure from the most moral army in the world. My blessings are with you and thank you and the rest of Ta’ayush for putting yourselves continuously in danger in the name of Justice. Thanks Soryl, I remember you doing your thankless task of working on the road that Ramadan, and you certainly deserve to see flowers! thank you so much for sharing this day with us in pictures and words! Looking at them was like spending relaxed time with you all, mixed with attentive suspense. What amazing colours, flowers, human beings and animals – in a prolonged atmosphere of togetherness. Until the harassing started again. Thank you for looking after those two stolen donkeys! no wonder there is a silence, because there is no word to bridge this blatant contrast of visions and missions.